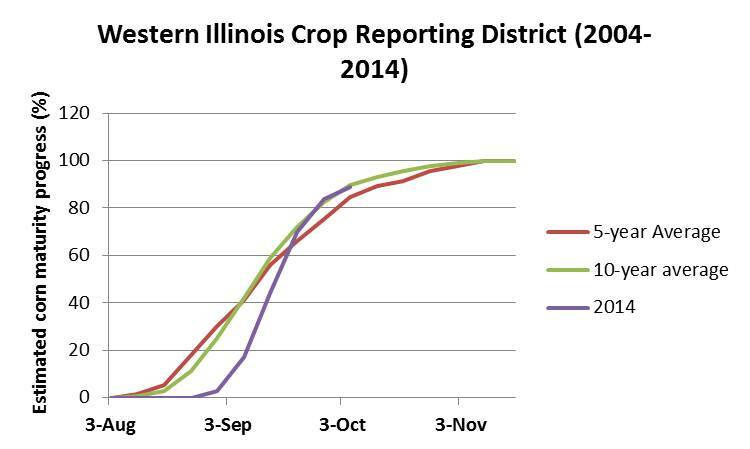 How do 2014 crop maturity and harvest compare to 5- and 10-year averages? Note: click on photo to enlarge or see caption. Crop maturity. As corn plants require heat in order to grow and develop, the cooler than normal temperatures that occurred throughout the 2014 growing season slowed crop development. Temperatures were more favorable for crop development and in-field grain drying during the last 7 days of September when high temperatures reached into the upper 70's to mid-80's. 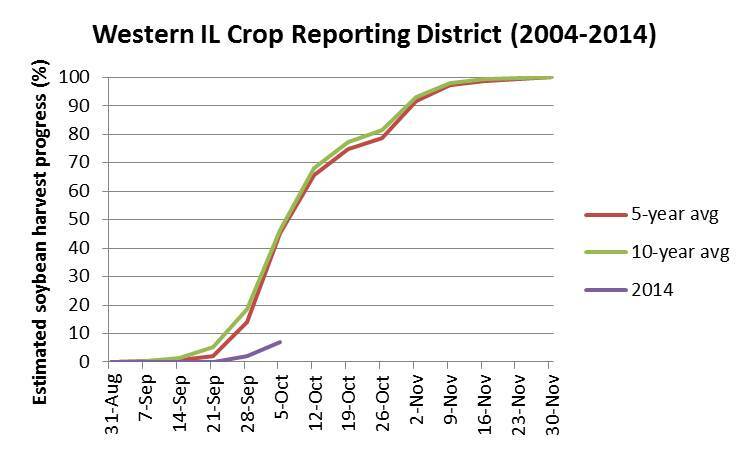 According to estimates compiled by the USDA-NASS, development and maturity of the corn crop in the Western Illinois Crop Reporting District (CRD) has recently caught up to the 5- and 10-year averages, with an estimated 89 percent of the crop reaching physiological maturity as of October 5 (Figure). Soybeans, however, hover slightly behind the 5- and 10-year averages with an estimate 90 percent of the soybean crop having dropped its leaves. Harvest Progress. More than 1 inch of rain fell late last week in Western Illinois, with 1.6 inches measured at the Northwestern Illinois Agricultural Research and Demonstration Center (NWIARDC) outside of Monmouth. This significant rain event halted both corn and soybean harvest, as soil and crop conditions were no longer favorable. Corn. 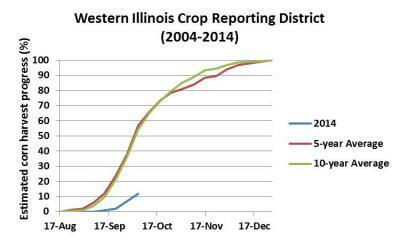 In the Western Illinois CRD, an estimated 12 percent of the corn had been harvested by October 5 (Figure). 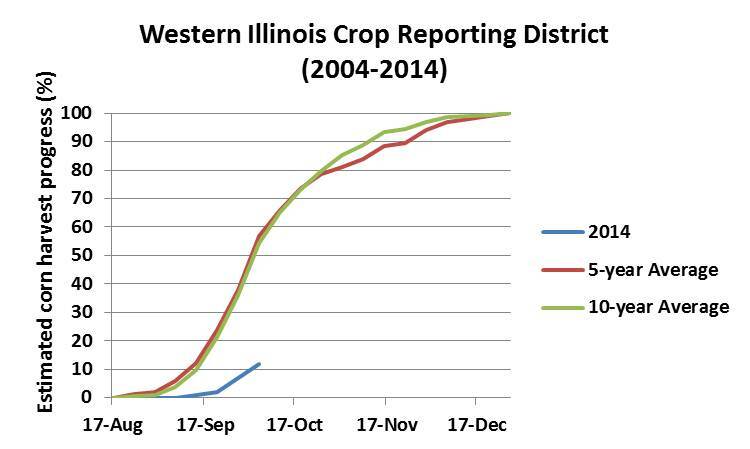 This estimate is in stark contrast to both the 5- and 10-year harvest estimates for the district, when more than 54 percent of the corn crop had been harvested by this time. Although late week rains likely slowed some harvest plans, the overall lower than average harvest progress may be due to an effort by producers to minimize grain drying costs by allowing grain to dry down naturally in the field. Soybean. Soybean harvest stalled at 7 percent in the district and is also behind the 5- and 10-year averages of more than 45 percent (Figure). NWIARDC. Before the late-week rain stalled harvest, Brian Mansfield and Marty Johnson harvested more than 30 percent of the total corn acres (trial and bulk acres). Grain moisture was between 19 and 22 percent and the preliminary grain yield average was higher than in past years at 208 bushels per acre. Tips to maximize storage life. The bin-busting, record-breaking corn and soybean crops that are predicted this year, combined with a decades-low beef cattle herd, a large carryover of previous year's corn and much lower near-term commodity prices lead many agricultural economists to predict that this year's crop may be stored on-farm longer than in recent years. To maximize grain storage life, grain must be uniformly dry and cool. To learn more about successful insect management in farm-stored grains check out a recent article written by University of Missouri Entomologist Dr. Wayne Bailey entitled, "Insect Recommendations for On-Farm Stored Grain". Iowa State University Agricultural and Biosystems Engineer Dr. Charles Hurburgh Jr. recently wrote an article titled "Quality and Handling of the 2014 Iowa Crop-Update". This article offers suggestions for managing stored grain and provides web links to training modules on various topics related to grain storage.